Connect this product to your phone and TV,USB 2.0 interface connect to 5V/1A charger. 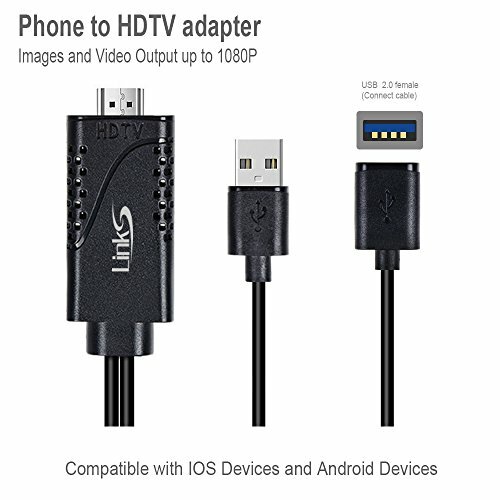 Insert the lightning cable HDMI connector into the HDMI of TV/Monitor/Projector, and synchronize the TV signal source with the current signal of HDMI. Connect the moblie phone and the lightning cable with the USB cable, just click"Trust", wait 10 seconds to synchronize the phone screen with the TV. Please open your cellphone"Developer Options", then choose "USB debugging", then click"OK", trust the devices. If it still can not work, please scan the code software on the TV to download " EZCAST" apps. 1. Not work with Apps which have "HDCP" video copyrights protection like Netflix, Honda motor... due to they aren't authorized for third-party software sharing. 2.This requires external USB cable to supply power,please use original or high quality device cable to make sure additional cable could transfer data not just a charging cable. ONE-YEAR SOLID WARRANTY: Once you buy our product, you can get our 1 year warranty. We offer 12-month warranty and friendly customer service. For any defective product or product you aren't satisfied with, you can freely contact us for a refund or a replacement. 2.Plug and Play--Plug the HDMI output to your HDMI-Enabled devices like HDTV/ projector,and connect the USB type-A port with an external (5V1A) adapter to supply power,then connect the lightning plug with your iPhone/iPad. Easy to Use. 3. Wide Compatibility. Compatible with Both Apple Devices and Android Devices: iPhone 5/5c/5s/6/6 Plus/6S/ 6S Plus/7/7 Plus,iPad and ipod.Samsung Galaxy /S6/S6 edge/S/S4/S3 NOTE2/3/4/5/7/Edge.Google Nexus 5/ 5x/ 6p,LG,Sony,Motorola,Sony,HTC,Huawei etc,.Please kind check whether your phone's version is compatible with before you purchase. 4.Enjoy Big Screen Easily-It's super cool to enjoy the super big screen from your phones /iPad ,and the Images and video output up to 1080p . 5.While connecting to your iPhone/iPad/iPod, the phones screen will pop out a "Trust" option, just click it then wait about 5-10 seconds for connection automatically. We have ONE-YEAR SOLID WARRANTY: Once you buy our product, you can get our 1 year warranty. For any defective product or product you aren't satisfied with, you can freely contact us for the full refund.